Come join us for a medieval collection of wonderful romantic tales that take place during the hottest part of the year with ONE HOT KNIGHT! 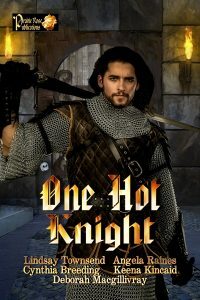 This unusual offering of summertime stories set between the medieval times of 1100-1300, of hot nights and even hotter knights, will keep you reading long past bedtime. You’ll be entranced with these five tales of knights and their ladies from some of today’s top medieval authors, as well as some rising stars in this up-and-coming genre. Lindsay Townsend, Deborah Macgillivray, Cynthia Breeding, Angela Raines, and Keena Kincaid offer you some of the best medieval-themed stories written, filled with romance and intrigue, laced with traditions and celebrations of this rich era. Prairie Rose Publications is proud to introduce yet another wonderful collection of exciting tales for your reading pleasure. ONE HOT KNIGHT is sure to bring you hours of enjoyment as you read on to find out how these knights and ladies will find their very own "happily-ever-after" endings at this very “hottest” time of year!